Sow the grass seeds provided and watch their garden grow! Fairy Belle can sit on her unicorn or perch on the side of the wishing well to make a wish! Create a magical unicorn garden where Fairy Belle can make a wish. 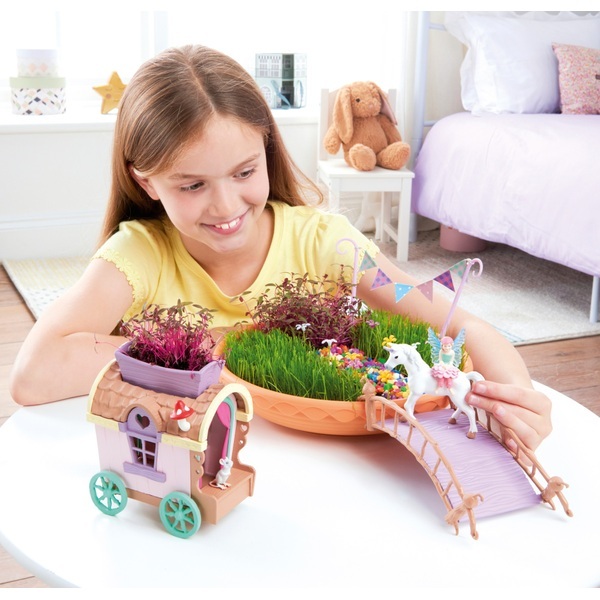 My Fairy Garden Unicorn Garden is a Grow & Play playset that includes everything you need to make an enchanting garden that is sure to attract unicorns and fairies to your home! The pack includes a beautiful fairy, a unicorn, a sparkly fairy cottage, fairy dust, a wishing well with working acorn bucket and lots more. Follow the activity guide to learn how to create a beautiful living garden with the grass seeds provided. EU Warning: Not suitable for children under the age of 3 years due to small parts which could cause a choking hazard. None of the accessories in this kit should be allowed to come into contact with foodstuffs. Wash hands after use.